The Imperial Japanese Navy approved in February 1944 the development of a new top-secret weapon called a kaiten, a manned torpedo to be launched from a submarine. In September 1944, a base for kaiten production and testing was opened on Ōtsushima  Island in Tokuyama Bay in Yamaguchi Prefecture. The first kaiten attack on American ships took place on November 20, 1944, and kaiten attacks continued until the end of the war. Due to strict military secrecy surrounding the kaiten program, facts concerning deployment of manned torpedoes did not get disclosed to the Japanese public until after the war. 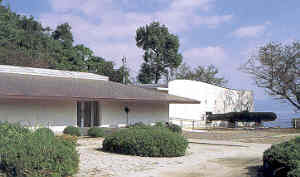 The Kaiten Memorial Museum opened in 1968 at the site of the original kaiten base on Ōtsushima Island, and the museum facilities were renovated in 1998. The museum's exhibits are arranged generally in chronological order, and there are many photographs of the base during the war. The museum also displays kaiten pilot letters and typed copies next to several of them to allow for easier reading. A relief map of the island and a model of the base provide the visitor with a visualization of the base's layout and the three increasingly difficult courses followed by pilots in training. 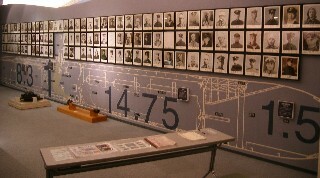 The museum's exhibition room also has individual photos of kaiten pilots who perished arranged by date of death. The exhibits explain that kaiten training took place at three other bases opened after Ōtsushima Base, including two nearby in Yamaguchi Prefecture (Hikari and Hirao) and one in Ōita Prefecture (Ōga). On the other side of the island from the museum, visitors can view the remains of a concrete building where kaiten were launched for training. One gets there by walking through a tunnel used to move kaiten by rail from the assembly and repair facility to the launch site. The tunnel now has several enlarged wartime photos and explanations of kaiten history. There is a full-scale model of a kaiten in front of the museum building. Next to the museum stands the Kaiten Monument, which in 1961 replaced the original one built in December 1945 . A small room near the museum entrance seats about 12-15 people who can view a 20-minute film entitled Jidai no shōnin (Witness of the times). The film features four former kaiten pilots  who survived the war. They each give extended comments on their experiences as a kaiten pilot. The back of the film room has a plaque dedicated to Katsurō Mōri, who was instrumental in founding the museum. He began working at Ōtsushima in 1937, when the Type 93 torpedo was launched in testing there. When the war ended, he took many valuable historical materials and photos from the kaiten base, and he buried them in Shiga Prefecture so that the American military could not find them. During the next two decades Mōri visited many bereaved families around the country who had lost a family member as part of kaiten operations, and he collected many items from them. These materials from the kaiten base and from bereaved families became the foundation for the Kaiten Memorial Museum that opened in 1968. A 30-minute film in Japanese and English gives the history of the kaiten program. A museum worker will show this film on request in the meeting room. The reason for the kaiten, in the words of one pilot who later died in training, is read by the narrator, "There was no other way but to use this type of weapon to counter imminent defeat. . . . Our fleets could not go anywhere without being detected by the enemy radar." The film and museum never give a summary of the military effectiveness of the kaiten weapon, which resulted in relatively little damage to the American fleet in comparison to the losses of kaiten pilots and submarines by the Japanese Navy. However, the film has a man, who trained as a kaiten pilot, explaining that the kaiten was the "most efficient" weapon, since the manned torpedo was more successful than the suicide air attacks that only hit one in ten targets. The confirmed damage to the U.S. fleet of two vessels sunk by kaiten does not support his optimistic assessment. The film also presents excerpts of kaiten pilot letters, and the narrator says, "the last things soldiers wrote while on these missions showed they were at peace with the world." The newest major exhibit inside the Kaiten Memorial Museum is the kaiten interior model that was used for Deguchi no nai umi (Sea without exit), a 2006 film about four kaiten human torpedo pilots, including a former college baseball pitcher, on a suicide mission. The model has a diameter of 1.25 m, whereas an actual kaiten had a diameter of 1 m. The interior model kaiten includes a hatch from the mother submarine into the kaiten. 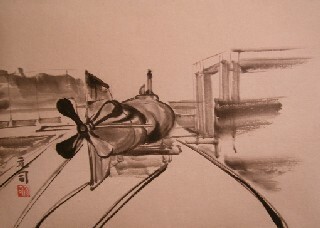 Title: Kaiten on rails to launching site. This India-oil painting by former kaiten pilot Motoshi Nakashima , who survived the war but is now deceased, is on display at the museum. The painting shows the remains of the kaiten launching site, which can be viewed today on the other side of the island from the museum (see photo at bottom of page). 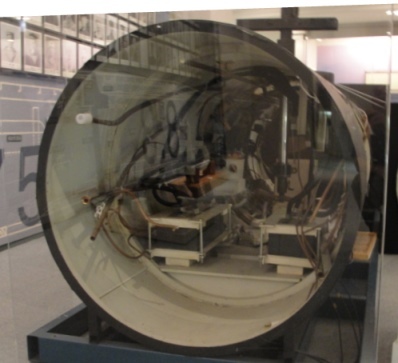 The kaiten manned torpedoes were part of Japan's special attack forces, which made suicide attacks on Allied ships. Japanese people do not use the word "kamikaze" to refer to the kaiten weapon even though non-Japanese often use this word to refer to any type of suicide attack. The museum exhibits do not use the word "kamikaze," but the title of the English version of the museum's film is "World War II, Kamikaze Submarines." The former museum director explained in 2004 that "manned torpedo" is a more proper English translation for kaiten than "kamikaze submarine." The museum can be reached from Tokuyama Station, a Shinkansen bullet train stop, by walking two minutes to the port and then taking a 45-minute ferry ride to the island. The museum's exhibits are all in Japanese. However, in addition to the 30-minute film in English, the attendant will play a 10-minute English tape on the overhead speakers so that English-speaking visitors can listen while viewing the exhibits. The tape narrative gives the general history of the kaiten and does not explain specific exhibits. The museum store sells an excellent Japanese book by The Mediasion Co. (2006) about the history of the kaiten. This book has numerous historical photos and details about the four kaiten bases and the eleven kaiten squadrons that made sorties. The audiovisual room has a library of about ten books on kaiten and five books on special attack forces. Museum admission costs 300 yen (about US$3). The museum does not have a web site, but Shūnan City, which includes Ōtsushima Island, has several web pages about the museum and island with basic information and several photos. 1. The island's name does not have a standard rendering in English. On my 2006 visit, two signs in Shunan City, which includes the island where the museum is located, showed "Ohzushima" rather than "Ōtsushima." However, the island's name is shown very infrequently with English letters, so the appearance of "Ohzushima" on these signs should not be considered as definitive support that "Ōtsushima" should not be used. 2. Kaiten Kichi 1999, 28-29. 3. Kaiten Kichi 1999, 75; Mediasion 2006, 40, 78; O'Neill 1999, 200, 214; Warner 1982, 334; Yokota 1962, 266. 4. Kaiten Kenshōkai 1965, 70. 5. These four former kaiten pilots were Toshiharu Konada, Hideo Kobayashi, Teruyoshi Ishibashi, and Harumi Kawasaki. 6. The pronunciation of this name could not be verified. His given name could be Motoji. His family name could be Nakajima. Kaiten Kenshōkai (Kaiten Memorial Association). 1965. Kaiten. No place: Kaiten Kenshōkai. Kaiten Kichi o Hozon Suru Kai (Kaiten Base Preservation Society). 1999. Kaiten Kinenkan gaiyō, shūzō mokuroku (Kaiten Memorial Museum summary and collection listing). Tokuyama (now Shūnan), Yamaguchi Prefecture: Kaiten Kichi o Hozon Suru Kai. Yokota, Yutaka, with Joseph P. Harrington. 1962. Kamikaze Submarine. Originally published as The Kaiten Weapon. New York: Nordon Publications.